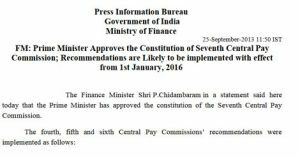 The average time taken by a Pay Commission to submit its recommendations has been about two years. Accordingly, allowing about two years for the 7th CPC to submit its report, the recommendations are likely to be implemented with effect from 1.1.2016. The names of the Chairperson and members as well as the terms of reference (ToR) ofthe 7th Pay Commission will be finalised and announced shortly after consultation with major stakeholders. Previous Post: Review of CSSS in the Grede of Personal Assistant under FR 56 (j) and Rule 48 of CCS(Pension) Rules, 1972-reg.